Days after Kanye West's new album Yeezus leaked, Jay-Z announced a new album called Magna Carta Holy Grail, proving that Kanye's aspirational ego has rubbed off on Hova a little. But the rappers have a lot of things in common now: their famous girlfriends and wives, their huge record labels, the highly publicized births of their children, their clothing lines, and now, their new albums. Despite their close relationship, it seems like there may be a little friendly competition going on here, so let's go ahead and judge. Jay-Z: Bonnie and Clyde, Jay-Z and the Queen B. It seemed only natural that one of the biggest names in hip-hop would get hitched to the most powerful woman in pop music. Notoriously private, Jay-Z and Beyoncé kept such a low profile on their relationship that America found out about their wedding nearly a month later. Kanye: In contrast, Kanye's relationship with Kim Kardashian has been all over the place, but that's what happens when you get involved with the Queen of Reality Television. They seemed like an unlikely couple before, but they're both really into fashion, so... there you go. Winner: Jay-Z. No offense to Kim, but I'm pretty sure there's no one on the planet who could beat out Beyoncé. Jay-Z: You can find Rocawear at a department store near you. Kanye: Ye recently had his second fashion show for DW Kanye West at Paris Fashion Week. Winner: Kanye, hands down. Dude's just got a natural aptitude for fashion. Jay-Z: Roc-A-Fella boasts a roster that includes big hitters like Cam'ron, Kanye, and the man himself as well as some weaker one-hitters (remember Jadakiss?). Kanye: There are fewer releases but bigger names with Kanye's younger label G.O.O.D. Music, which has been graced by albums from John Legend, Pusha T, Common, and Kid Cudi. Winner: A tie. 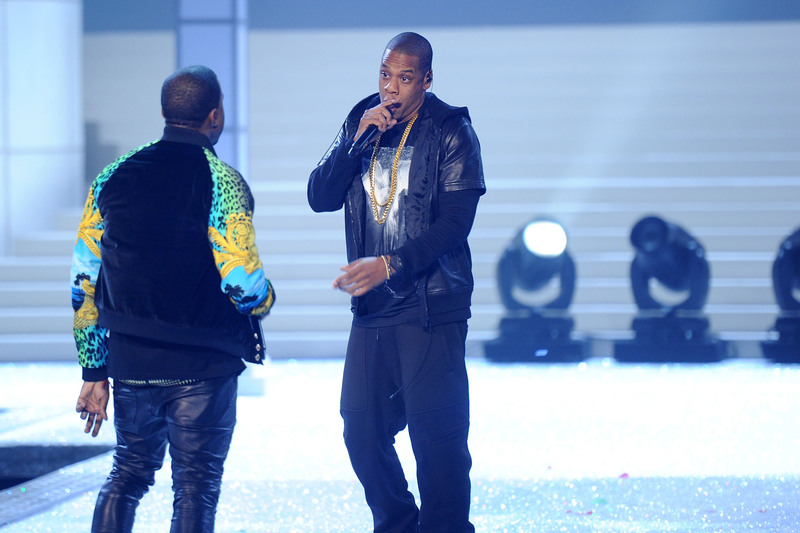 Roc-A-Fella is certainly the more established label, but it leans heavily on releases from Kanye and Jay-Z. G.O.O.D. Music has bigger back for its buck, but is not nearly as prolific. Jay-Z: If there was a title for Most Famous Fetus of the Year, Blue Ivy would have won it. Kanye: Born only days ago, if Blue Ivy was the Celebrity Baby From on High, Kim's spawn was the second coming. Winner: Almost too early to call at this point, but I predict a tie. Both babies were probably the most anticipated births of the past few years, if not the decade. Jay-Z: Magna Carta Holy Grail is sponsored by Samsung, who have practically made the album go platinum already by purchasing 1 million advance copies for Galaxy users. From the Samsung commercial that advertises the album, it looks like producer Rick Rubin helped work on it. Over-the-top name. Kanye: Yeezus has been talked about nonstop from the time Kanye advertised it to projecting his face on the side of buildings to its recent leak. Produced by Rick Rubin. Over-the-top name. Winner: Definitely too early to tell, although I'm eager to see if Jay-Z can top Kanye in terms of outrageous album promotions. Hopefully this time we can get a full hologram performance.